I remember when I finally figured out jump rings. It was like the heavens opened up and my whole world changed. Well, maybe not quite all that, but it was pretty exciting. Once you figure out this basic skill, you have a lot more options. And it’s pretty simple, you just need to know how to do it. 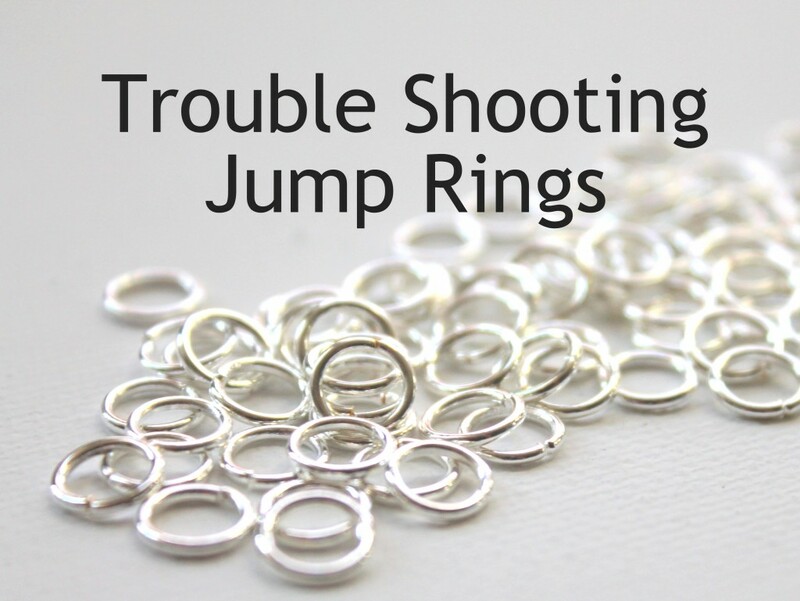 Even if you know how to properly open and close jump rings they can still cause you trouble. They can open when they shouldn’t, don’t close properly, look wrong and just be all around frustrating. I use jump rings in a lot (if not most) of my jewelry projects, so you might as well get used to them! If your jump ring is too thin (the gauge is too thin), the jump ring will have trouble holding its shape as well as holding together whatever else it’s holding. If your jump rings keep opening, this might be the issue. In this case use a thicker jump ring. First make sure you’ve closed it properly. However, this can happen sometimes even if you do close it properly. Wire tends to spring back wherever it wants and doesn’t always go where you want it to go. To fix it, wiggle the wire back and forth, opening and closing the jump ring until it clicks into place. This can happen, too, even if you closed the jump ring properly. Sometimes you make a mistake that you didn’t realize or sometimes the jump ring wasn’t perfect when you got it. I sometimes try to fix it, but usually it’s much less frustrating to just get a new jump ring and start again. Usually it’s not worth your frustration. I hope these help you with any issues you may have with jump rings. If you have any other questions, leave a comment (reply) below and I’ll try to help you! Have you gotten my Wire Wrapping for Beginners book? There is an eBook version that you receive right away or the print version that you can hold in your own hands that’s mailed to you. Click here to learn more about both. This entry was posted in Jewelry Making Techniques, Jewelry Tutorials and tagged how to make jewelry, how to use jump rings, jewelry diy, jewelry making, jump ring trouble shooting, jump rings by Kimberlie. Bookmark the permalink.